It is a strange thing to investigate the murder of one’s own family. Although it happened some seventy years ago, long before my birth, I am familiar with some of the effects of my grandfather’s murder. There are generational ripples still emanating from this tragic stone cast into the social pond of my father’s youth. The Germans entered Lwów with a plan. The executor of this plan was SS Brigadenführer Dr Eberhard Schöngarth, head of the Security Police in the Nazi Generalgouvernement. He lectured at the infamous Security Police Academy Bad Rabka, known locally as ‘Death’s Head Resort,’ south of Kraków. He was already known to the professors of Lwów with horror. Schöngarth had been one of those responsible on November 6th 1939 for rounding up their colleagues in Kraków and dispatching them to concentration camps. This was an essential part of Nazi military protocol. There were at least four massacres which took place before during and after the German occupation of Lwow. The NKVD Prison Massacres refer to the mass killing of Polish, Ukrainian, and Belarussian prisoners by the Soviet NKVD, following the German invasion of the USSR on June 22nd 1941. Two Lwów Pogroms took place; the first when the Germans occupied the city from 30 June to 2 July 1941 and a second during 25–29 July 1941. They involved attacks on Jews by German Einsatzgruppen and Ukrainian militia. The fourth massacre was the execution of twenty five professors along with members of their families and guests by German Einsatzgruppen. This massacre took the life of my grandfather and is the one described here. SS Brigadenführer Dr Eberhard Schöngarth, Nazi Security Police Chief , commander of Einsatzgruppe ZbV, and architect of Henryk’s murder. 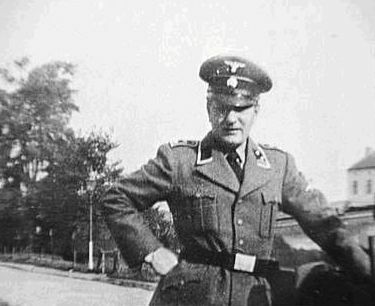 Pieter Menten, during the war in SS uniform. The ‘Looting Dutchman,’ made a fortune out of the art and antiques he pilfered from those he helped execute, including the Lwów Professors. He wasn’t imprisoned until 1980, and served six years of a ten year sentence for murdering Jewish villagers in 1941. The first to fall victim was one of Henryk’s friends, former Polish Prime Minister and Professor of the Technical University, Kazimierz Bartel. He would remain in detention for the next three weeks, after which he was disappeared. The others wouldn’t last as long. On the night of July 3rd to 4th, between 10pm and 2 am, they arrived at the professors’ houses with orders to arrest the professors and, like the Angel of Death collecting ripe cargo for eternal dispatch, any male over the age of eighteen found in their houses. While the inhabitants were questioned, other members of the arrest team confiscated any easily-pocketable loot, such as money, watches, and gold jewellery, while a note was made of any decent antiques or paintings which could be pilfered later. The intestate property of those who were about to die could be attained with the right connections, once death certificates could be produced. The Dutch lumber merchant and art collector Pieter Nicolaas Menten played a significant role in identifying the best antiques and paintings in Lwów. He had lived in South-Eastern Poland since the 1920’s and knew many of the professors, as well as art dealers, businessmen and politicians. Before the war, he became a naturalised Pole, as well as the Dutch Honorary Consul to Kraków. When the Germans invaded, he saw an opportunity for self-advancement. He offered his services to the SS as an adviser/interpreter, was given the rank of SS Hauptscharfuhrer and was put in charge of administrating Jewish art and antiques. He apparently advised the Einsatzgruppen to put prominent citizens, whose possessions he coveted, onto the death lists. While the possessions of the dead were supposed to be sent back to Berlin, he seems to have had some sort of private deal agreed with Schöngarth, and his subordinate in the security services, Capt. Hans Krueger, to shift part of these valuables into their own pockets. Menten eventually returned to Holland, in 1943, with Schöngarth’s assistance and a private train filled with art seized from his executed victims. When Schöngarth himself was later transferred to Holland, the two men remained in cordial contact. There, Menten remoulded himself as an art dealer after the war. Although he served eight months in prison in 1948 for serving as a Nazi interpreter in uniform, he was only brought to justice and put on trial for murder in 1976, after he had put the contents of his Amsterdam apartment up for auction and the provenance of his objets d’art drew attention to his shadowy past. He eventually served six years of a ten year sentence for the mass killing of Jews in the Stryj Valley. He was unrepentant to the last, claiming in court he had been promised immunity from prosecution by a deceased former Minister for Justice, on condition that he kept a secret file on the collaboration of Dutch officials with the Third Reich buried. When he was released from prison, in 1985, he decided to evade the spotlight of public opinion and retreat to his mansion in Ireland, but by then his reputation was already too tarnished and the Irish government refused him entry because of his war crimes. He died in Holland in 1987. The Einsatzgruppen didn’t mention to those they were taking away what was going to happen to them. They had their ways, developed through experience, on how to create the maximum efficiency and the least commotion when forcing a man, men, or whole families to vacate their houses and come with them into the night. Don’t worry. It’s just some routine questioning. You’ll be back by morning. They were taken to a makeshift interrogation centre, which, ironically, was housed in an academic institution, on Abrahamowicz Street. Here men and women, educated and respected in their community, were harassed and harangued for all things imaginable. All of the professors could be accused of collaborating with the Bolsheviks, as indeed could any citizen of Lwów who had lived through the Soviet occupation. However, the interrogation was mostly routine, for the sentences were a given. They weren’t interested in beating information out of these custodians of knowledge and tradition. The Nazi theory of civil administration had different priorities. While the professors and family members were made stand against a wall, awaiting individual interrogation, they were insulted and beaten. One unfortunate man, an engineer by the name of Adam Ruff suffered an epileptic fit. A Gestapo officer shot him on the spot. Ruff had had the misfortune to be with his parents, Dr. and Mrs. Stanisław and Anna Ruff, visiting a family friend, Professor Ostrowski, when the Germans came. The Ruff family wasn’t on the Germans’ list but they were arrested nonetheless. Later, his body, carried by his colleagues, was placed in the same pit on Wulecka Heights where the bodies of the Professors, shot four at a time, collapsed and fell. They were executed in the early hours of the morning when the curfew was still in operation. But despite the precaution, witnesses on Nabielak St. and Małachowski St. could see this gruesome scene played out again and again, as group after group make their final walk to a hole in the ground on a scrap of wasteland on a hillside. They were ordered to stand before the hole facing a line of soldiers. . They were then ordered to remove their hats. They always ordered those whom they were about to shoot to remove their hats. The reason was not to sanctify the unholy act but rather to make the head shots count. There was no mercy on the part of the firing squad and probably little thought of rebellion on the part of the victims. The Einsatzgruppen had a way of dealing with their captives, a process of execution which minimized any fuss. The professors, even though there were veterans among them, were not young. They were not armed, nor dressed for war. They were hidden from their compatriots who might have been able to help them. They were alone. Perhaps they did consider giving their executioners something to remember. And then perhaps they thought of their wives, their children, their parents, of what might happen in reprisal. That is most likely what the killers said to them at the outset. Comply and your families are safe. Roman Shukheyvich, military commander of the Ukrainian Insurrectionary Army (UPA) and the Nachtigall (‘Nightingale’) Battalion, a SS Ukrainian unit. While Schöngarth’s Einsatzgruppe was behind the round-up, the firing squad may have included several members of the Ukrainian Gestapo. Later, during a Soviet trial (whose instigation had overtly political motives) the Ukrainian SS Nightingale Battalion was implicated in the murder of the professors. The issue of Ukrainian-Nazi collaboration continues to haunt Ukrainian-Polish relations and it is not surprising to see historical evidence at times being muted to the benefit of insinuation or manipulated by false accusations and even show-trials. Suffice it to say, we know more or less the Germans involved in the murder of the professors, but we don’t know which, if any, Ukrainians aided or attended, or took part in the murders. Even those who agree on the complicity of members of the Nightingale Battalion and their military commander Roman Shukheyvich, have different opinions on whether members took part in an official capacity, as representatives of a more extremist sub-group, or, indeed, as individuals. Among his supporters, Shukheyvich remains a champion of national resistance, who did what he did, playing the hand he was dealt, with the goal of creating an independent Ukraine. Among his detractors, his realization of that new Ukraine promoted a narrow vision of ethnic exclusivity which undoubtedly contributed to the persecution and execution of tens of thousands of civilians in the balancing of a racial equation. Of course, not only are the guilty rarely forthcoming with admissions of guilt but the multivectored re-telling and branding of history as myth has consciously and unconsciously served to fan political and ethnic schisms. Professor Bartel, the first of the Lwów professors to be arrested was the last to be murdered. As a former Polish Prime Minister, he may have been kept alive by virtue of being seen as a possible figurehead for a Nazi puppet government. He had been in negotiations previously with the Soviets, a sign of his political value. He was sentenced to death on July 26th. 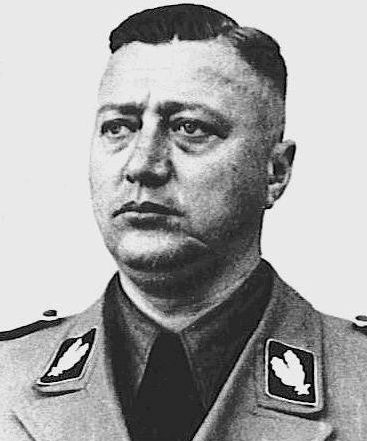 Much later, Die Welt claimed that unearthed Nazi documentation indicated that Professor Bartel had refused to collaborate with the Germans and was executed on Hitler’s direct orders. Dr. Schöngarth no doubt executed his master’s order. With Bartel now dead, Dr. Schöngarth, the architect of all these murders, moved into the Professor’s house on Herburtów Street. Bartel’s wife and daughter had been evicted the night he was first arrested. With the murder of the Lwów professors, their families and friends, a significant part of the culture and society of Lwów also died. They were chosen precisely because they were eminent scholars, surgeons, and civic leaders. The Nazi philosophy sought to eliminate any figureheads, rallying points around whom the population might gather. They hoped thus to speed up the process of enslavement. Before the Russians, and, then, the Germans, came, Lwów had been a vibrant and distinguished academic and cultural centre. Lwów of the 1930’s was famous for its scientists, writers and mathematicians. There were many luminaries. Some died, some were murdered, and some left Lwów in the years immediately prior to the war and so survived: Ludwig von Mises, one of the most influential economists of the 20th Century; his brother, Richard von Mises, mathematician and aero-dynamist; Stanislaw Marcin Ulam, one of the principle creators of both the Atom bomb and the Hydrogen bomb; his brother Adam Bruno Ulam, who would become America’s leading Sovietologist. Lwów was a city fertile with creativity. There the mathematicians Stefan Banach, Juliusz Pawel Schauder, Hugo Steinhaus, Mark Kac, Kazimierz Kuratowski, and Karol Borsuk flourished, the nucleus of an informal mathematical society which used to convene at the Scottish Café, to set brain-teasers and conundrums for each other. There the philosopher Martin Buber grew up, and the Jew turned Muslim scholar Mohammad Asad was born. The city was full of fascinating personalities, bright minds, and eccentric characters. My grandfather ran something of a salon for the bridge players of Lwów, of whom there were many before the war. There were often many interesting characters to be seen bustling about the house, a fact which added a touch of colour to my father’s childhood. One of Henryk’s friends was the anthropologist, Jan Czekanowski, who used to visit the family house regularly. Czekanowski was a fantastic linguist. During the war, he was credited with saving the Karaim peoples of Lithuania, whom the Nazis wished to see exterminated, on account of the fact that they spoke a form of Hebrew. One of grandmother’s friends was the Countess Karolina Lanckorońska. She lectured in art history at Lwów University. She worked actively in the Polish underground during the war and she would play an important part in uncovering the truth behind the execution of her colleagues, the professors. A couple of years later, while she herself was in prison, awaiting execution, her interrogator Hauptsturmfuhrer Hans Krueger, SS Captain and formerly a subordinate of Schöngarth, mockingly confessed to the execution of the Lwów professors. Krueger was connected in one way or another with the deaths of up to 70,000 people, mostly Jews. By a stroke of good fortune and the intercession of the Italian Royal family, the Countess was not executed but instead sent to Ravensbruck women’s prison. She publicised what she knew about Krueger’s guilt, and, in a strange twist, Krueger, was tried by the German military for betraying secret information. He lost his post at the Security Police Command in Stanislawów, where he had waged a blood-thirsty pogrom against the region’s Jewish populations, enforcing the Nazi Final Solution with a salacious zeal. The Countess survived the war, and lived in exile in Italy until her death, aged 104, in 2002. She bequeathed a valuable art collection to the Polish State after the fall of Communism. 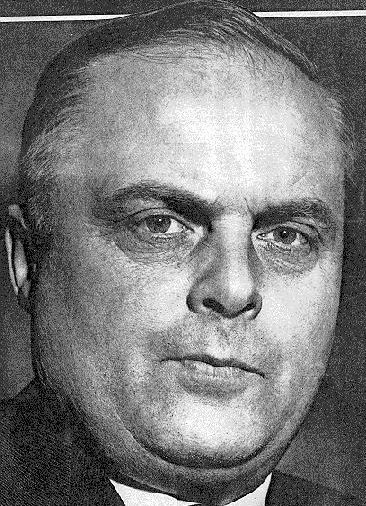 SS – Hauptsturmfuehrer Hans Krueger, co-conspirator in Menten’s appropriation of art and antiques. Hans Krueger also survived the war. His story is somewhat darker. He was born in Posen in 1909, which was, at the time, a part of Prussia within the German Empire. He was therefore of an age to remember his expulsion from that city following the creation of Poland’s Second Republic at Versailles. Perhaps in that humiliation laid the source of his anger. He joined the National-Socialists at a young age, rose through the ranks and distinguished himself in the ruthlessness of his dedication to the Nazi cause. He was picked up by the British Army, in Holland, at the end of the war, but released in 1948 due to lack of evidence. Later, he would work for a while as a travelling salesman. He created an anti-fascist past for himself and then entered local politics, even running as a candidate in the North Rhineland-Westphalia State Assembly Elections for the League of Eastern Expellees and Victims of Justice. He thus saw himself always as a victim, a crusader against injustice, oblivious to the devastation his own cruel excesses had wrought. He will long be remembered for Stanislawów’s ‘Bloody Sunday’, on October 12th 1941, when he and his men corralled the city’s entire Jewish population into a graveyard and executed up to 10,000 of them. His wartime activities finally caught up with him and he was put on trial for a long list of war crimes in 1967. He openly admitted that he was a SS Captain in Stanislawów, for he obviously believed he had left no victims behind who could tie him to any crimes. He seemed genuinely shocked when Countess Lanckorońska appeared as a witness in the trial. He was found guilty of numerous crimes arising from his time as Gestapo Chief in Stanislawów, where his savagery reached its cruellest proportions. Although he received a life sentence for those crimes, his implication in the murder of the professors wasn’t established. Later, a nephew of one of the murdered professors together with a group of Polish scholars tried to have Krueger tried separately for the Lwów crime. The German Prosecutor denied them on the grounds that he was already serving a life sentence for mass murder and no further sentence could be reasonably passed. He was released in 1986, and spent the last two years of his life a free man. Dr Schöngarth, who had orchestrated and coordinated the deaths of the Lwów professors, became the subject of an investigation, launched by Himmler himself, into the theft of Jewish property in Galicia, in 1943. He was removed from his post in Poland, and sent to Greece. At the same time, his henchman, Krueger, was transferred to Paris. Schöngarth was eventually captured by the British in Germany and convicted of a crime which had taken place in the grounds of the local Headquarters of the German Security Services at Enschede in Holland. Schöngarth had been attending a conference there when an Allied airman from a downed bomber parachuted unintentionally onto the grounds of the German Headquarters. Schöngarth was convicted of ordering the airman’s execution and was himself sentenced to death. His other crimes were not widely known at the time. He was hanged on May 16th 1946. Before his execution, he wrote a letter to his wife, requesting that she contact the Dutchman Pieter Menten, and remind him of his obligation to his old friend from the Galicia days. In this way, he hoped his family would be looked after with part of the proceeds of the murder and theft carried out by Schöngarth and his Einsatzgruppe in Galicia. 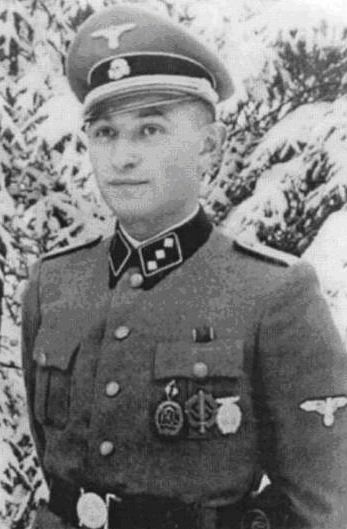 Theodor Oberlander, liaison officer to the Nightingale Battalion. 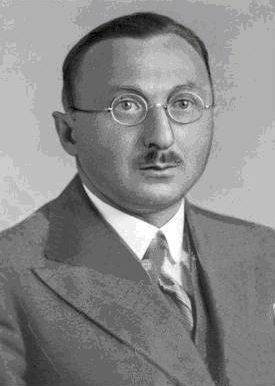 Another character associated with the Professors’ murder was a German professor of political science, an expert on Polish and Slavic affairs, who is claimed to have acted as a liaison officer between Himmler and the Nightingale Battalion – Theodor Oberlander. Some have argued that he was in overall charge of the Ukrainian Battalion which may have collaborated with Schöngarth’s Einsatzgruppe in July 1941 and that Roman Shukeyvich, the Ukrainian military commander, answered to him. He entered politics after the war and was elected to the Bundestag for the League of Eastern Expellees and Victims of Justice, the same party of which Hans Krueger was a member. He rose to the position of Minister for Refugees in Adenauer’s government. It was in this capacity, in 1959, that the Soviet Union saw the political merits of opening a case against him for the professors’ murders. The implication of Oberlander suited a dual political agenda for the Soviets. Not only could they embarrass a sitting minister of the West German government, but they could further tarnish the legacy of Ukrainian nationalism by presenting Shukheyvich’s troops as the Nazis’ compliant henchmen. 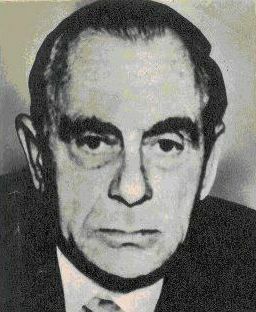 Oberlander was eventually found guilty by the East German Supreme Court and sentenced in absentia to life imprisonment. He was subsequently tried in West Germany and acquitted, due to lack of evidence. He stepped down from his ministerial post in 1960. His political career, associated with anti-immigration and right-wing nationalism, never recovered. He died, in 1998, with another trial against him pending which concerned a murder which took place in Kislovodsk in 1942. Walter Kutschmann (left), as Political Affairs Commissar of the Lwów Gestapo, may have played some role in the Professors’ murders. Kutschmann managed to take one of the so called ‘ratlines’ to South America, at the end of the war. He travelled to Argentina on a Vatican passport, and lived there unperturbed by the atrocities of his past. The Nazi-hunter Simon Wiesenthal, himself a native of Lwów, discovered he was living in Buenos Aires under the assumed name Pedro Olmo. He was held briefly by Argentinian Police in 1975 but was somewhat mysteriously released before the German authorities could process his extradition. He went into hiding but was arrested again in 1985; he died while awaiting trial. In addition to the murder of the Lwów Professors, he was accused of the deaths of 1,500 Jews in Brzeziny and Podajce, Poland, in 1942. And there were others. 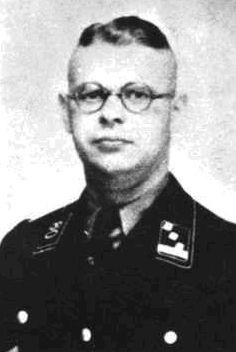 Sturmbannführer Kurt Stawizki, a subordinate of Schöngarth, may have been involved, as well as two other German officers named Hacker and Köhler, who were reported by surviving members of the professors’ families to have composed part of the arresting party.There was also SS Untersturmfuher Wilhelm Rosenbaum, Schöngarth’s sadistic subordinate. He had worked with both Schöngarth and Krueger at the Security Police Academy “Bad Rabka,” where his way of demonstrating his loyalty and devotion to his ideological hero, Schöngarth, was to excel his peers in his savagery towards the Jews. In 1939, Rosenbaum had been sequestered to the Security Police HQ in Kraków, which was then headed by Schöngarth. There he was assigned to collect ‘contributions’ from the city’s Jewish residents. Later he joined the teaching staff at Bad Rabka. In early 1941, he joined Schöngarth’s Einsatzgruppe and took part in its nefarious activities in Lwów in July. He subsequently returned as Head of the Bad Rabka School, and is remembered there for the torture and execution of Jews. He survived the war, unpunished, eventually opening a confectionery shop in Hamburg. In 1951, he visited the ‘looting Dutchman’ Pieter Menten in Amsterdam, allegedly to claim his share of the pilfered art and antiques amassed under Schöngarth’s tenure in Lwów and Galicia. In a bizarre and disturbing incident, the Dutchman had Rosenbaum act as witness in a case he was taking against the post-war German government for his arrest and detention by the SS in 1943 (when Himmler had launched a crack-down on the theft of Jewish property by members of his own security forces and Menten was expelled from Kraków.) With the crimes of both men still uncovered, Menten was awarded $200,000 in compensation. Rosenbaum was eventually tried for war crimes in 1961, and received sixteen life sentences. As in all these cases, the families of the victims seek to reclaim their dignity, and honour their dead; while the perpetrators seek to hide their involvement. When cornered, and put on trial, they all say variations of the same line: We were following orders. Those who do most damage, feel most victimized when faced with their crimes. For some of those who conspired to round up and murder the professors, there was some small measure of accountability and justice. My father’s memories of the execution of the Lwów Professors are concentrated in the events of 11th July 1941 when he saw my grandfather being taken away. Henryk of course would have heard rumours of what had happened to his colleagues after 4th July, as friends spread the word that a large number of professors had been ‘taken in for questioning’ by the Gestapo and were still missing. It was not widely known that they were all dead, until sometime later. He knew many of these missing men, and he could guess that they were targeted because, like him, they were professors. There were few precautionary steps though he could have taken. The German Army undisputedly held Lwów under its control. He would have found it difficult to leave should he have chosen to. Where should he run to? Germany ruled everything west of Lwów to France’s Atlantic coast. If he fled east, he would merely be following the German Wehrmacht into the Soviet zone, and into what was to become the bloodiest battlefield of the entire Second World War. Perhaps he could have sought shelter in the mountains. But there were his wife and his son. How could they pass through unnoticed? He did not know for sure that he was already on Dr. Schöngarth’s list. If he hadn’t already disappeared, perhaps he was safe? This was the gamble, despite the lack of options. Perhaps there is some solace in the fact Henryk did not leave his bones. He did not leave a description of his death in the eyes of witnesses who peered with horror from their windows and saw what was happening to their city. He walked out of his home and never came back. Perhaps his spirit still wanders the streets of Lwów. As his grandson, and knowing how his murder would forever change Wojtek’s life, that’s how I like to think of him, his spirit intact, and content that, now at least, Lwów is peaceful again. Ukrainian and Polish representatives gather in Lviv to celebrate the unveiling of a new monument to the murdered professors, on the seventieth anniversary of the massacre, July 2011. There are many monuments to Henryk and the other professors, in Lwów, in Warsaw, in Kraków, and in Wrocław. Their murders became a symbol, one of a litany of sad symbols, of the destruction of civilization. 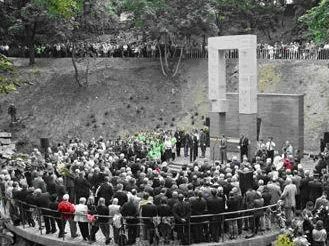 More recently, on the seventieth anniversary of the murders, a new monument was unveiled, under a joint initiative of Polish and Ukrainian scholars. When Wojtek was informed about it, in his final days, he would express his satisfaction that his father was remembered in Lwów. Though the monument is a grateful and encouraging sign of warming Polish-Ukrainian relations, he simply remembered the personality of the man who was his father. He was irreplacable. A few days after they took Henryk away, the Germans kicked Wojtek and Olga out of their house on Listopad Street. Some German officers would move in instead. They collected their things and moved in with Olga’s parents, Wojtek’s grandparents Antoni and Olga Pawłowski, and Aunt Jadwiga, who lived together on Krasiński Street. Wojtek’s grandparents were both old and ailing by that stage and would die of natural causes (no doubt exacerbated by the invasions) before the year was out. Albert, Zygmunt, “Kaźń profesorów lwowskich – lipiec 1941 / studia oraz relacje i dokumenty zebrane i oprac. przez Zygmunta Alberta” Wrocław 1989 , Wydawnictwo Uniwersytetu Wrocławskiego. An eye-witness of the murders himself, the Albert study is also based upon extensive interviews with other witnesses of the executions and with surviving family members of the victims. Here’s Philip Friedman’s account of the extermination of Lwów’s Jews in English. An eye-witness report written in 1945. This article has excerpts from the recently-published Polish translation of Dieter Schenka’s “Der Lemberger Professorenmord und der Holocaust in Ostgalizien” (“The Murder of Lwów professors and the Holocaust in East Galicia”). See: Leach, Daniel, “Fugitive Ireland: European Minority Nationalists and Irish Political Asylum, 1937-2008”, Four Courts Press, 2009. Also, Cathal O’Shannon’s television documentary “Hidden History: Ireland’s Nazis”, first broadcast by RTE1, 09/01/2007. Czekanowski convinced the Germans correctly that the Karaim were in fact descendants of the Turkic Crimean Karaites, who had converted to Judaism and taken its language sometime after the 10th Century. This meant that they were racially free of Jewish blood, and would thus not be sent to the camps. An act which no doubt would have earned the contempt of the above-mentioned ‘looting Dutchman’, Pieter Menten. Felix Landau, SS Haptscharfürher, a Gestapo officer who volunteered for Action Squad duty, kept a diary of his deadly activities. On the morning after Henryk’s arrest, Landau describes his activities in Drohobyc, two hours south of Lwów, which may give a clue as to the manner if not the circumstances in which he was killed. Landau ran a painting and decorating business in Bavaria after the war, and was finally arrested in 1959 and sentenced to life in prison for his crimes. Such History! How very tragic. Your words are history written from the personal point of view. Thank you for such an excellent piece! Thanks for your blog. Here is more information about Kutschmann. I am gathering and compiling all the information about nazis protected by Spain. This information is from OMGUS files and British reports. KUTSCHMANN, Walter. Classified B/242 III Priority. Obnoxious German proposed for repatriation from Spain. Repatriated by air 23 August 1946 (?). Flight X. Former Gestapo chief at Bordeaux who escaped to Spain where the German Embassy demanded his internment, having been imprisioned at San Sebastian after having refused to retur voluntarily by air to Germany. From a British report dated September 11, 1944: Subject arrived at Hotel Alameda, Zarauz, near San Sebastian on September 1st, 1944. Carried with him at all times a large and apparently heavy leather suitcase. Left September 5, 1944, in his car, plus enough luggage for several years: 7 suitcases of various sizes and a small black case which looked like a grammophone or radio. Card attached to one of the cases read: “Walter KUTSCHMANN. Kriminal Kommissar, Blankenberg, Harz, Herzogstrasse 17”. Description: Medium height and build; about 33 in 1944; fair hair; rather square face with straight nose; brisk military walk. Car. No 4814, AEI. A letter from the American Consulate, San Sebastian, dated December 1st, 1944, says that subject has been in Ondarreta jail for two months. A memo from Vice Consul N.O. Titus dated February 15, 1945 said KUTSCHMANN had been transferred to concentration camp at Miranda de Ebro in the section reserved for those who had been denounced by nazis. Designated as Hauptmann KUTSCHMANN of the Abwehr on order for transfer. But on February 14, from information received from a secret source it was learned that Foreign Office informed that Spanish DGS (Direccion General de Seguridad) had given him restricted liberty. On January 9, 1945, from a reliable source, it was learned that Spanish Minister of War (Juan VIGON) denied German petition for extradition of subject who is accused by them (Germans) of misuse of funds during the time he was a customs employee in France. From a memo to the US Embassy dated April 15, 1945: Subject was in a special section of Miranda reserved for deserters from German Army. This apparently was subject’s “pose” to hide from Allied search. Thank you! That’s fascinating material. Kutschmann was certainly one of those who managed to evade the consequences of his past quite successfully. Those Nazis who made their way through Spain, with assistance from the Vatican, to South America seemed to have had quite a support network. Would love to hear more. Thanks again!